How do I set work days or planned days in the Gantt chart? By default weekends are set as non working days and tasks are only planned on working days. 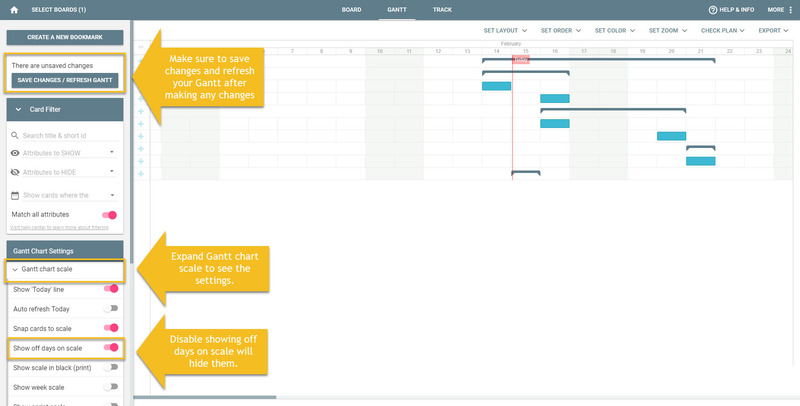 This means that when you drag a task in a the weekend, it will be automatically extended to cross the weekend. The screen recording below shows how a task with a one workday duration is automatically extended over the weekend. 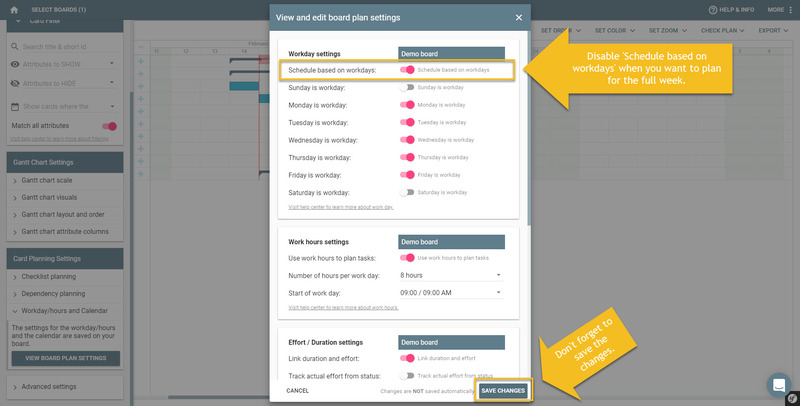 The workday settings are set on board level and available in the board plan attributes. 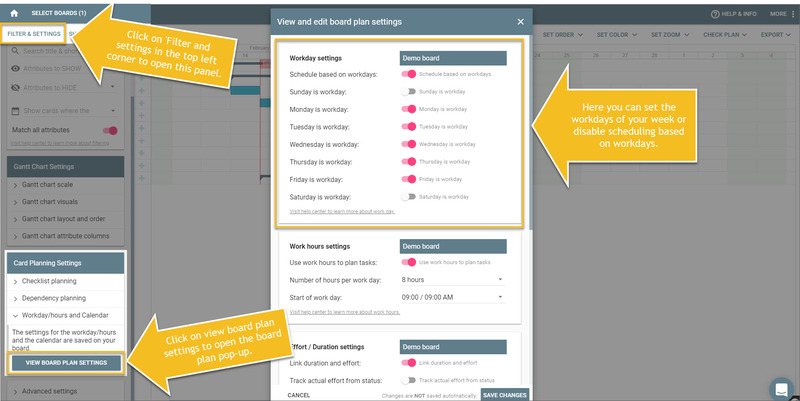 you can access the board plan attributes from the filter and setting menu. 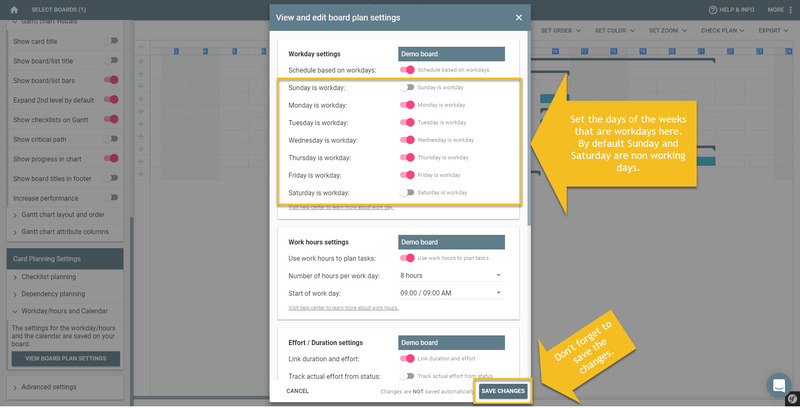 You can ignore the workday settings and plan on all days in the week, to do this disable the setting 'Schedule based on set workdays'. And save your changes to enable them. You can set which days of the weeks are work days. By default Saturday and Sunday are non working days but you can change this. For example, when Friday is a non-working day for you and Sunday is, you can change this from the settings pop-up. By default non working days are grayed out on the Gantt scale, you can also choose to hide them from the Gantt scale by deselecting 'Show off days on scale' setting. When you do they will be hidden on the scale, make sure to save your changes after you made them to refresh the Gantt in the right way. Our plan is to introduced availability calendars for each board that allow you to also define holidays as non-working days, next to the current days of the week. Please note that you can save your settings as a bookmark.